15 kms away from Airport with drive away time of 20-25 mins. 14 kms away from Nizamuddin Railway station drive away time of 15-20 mins. Also you can come by metro and the nearest metro station is Saket which is just 5 mins away from the hostel. • Tell the cab driver to take you to IGNOU Road, Neb Sarai. Ask him to cross the Saket metro station and take a U-Turn opposite SDM Court. • After you take the U Turn take the first left you are on the IGNOU road just come straight to the P S Bhallara office (Sahib real estate). 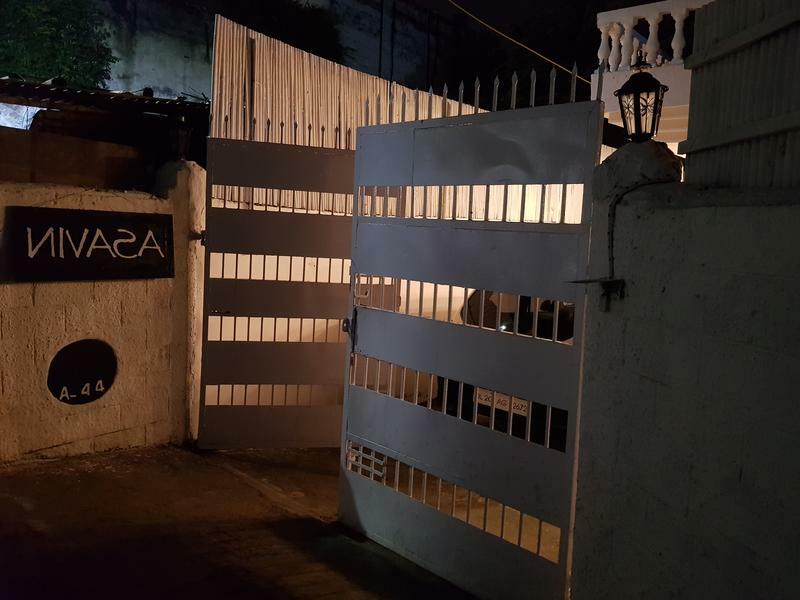 • After that you should be able to see the whole white boundary wall villa with Nivasa nameplate on the white gate. • Press the doorbell and you are ready to come in. Click the links for a map of the route from the Airport or the Nizamuddin Railway station, New Delhi Railway station or Old Delhi Railway station to Nivasa. • Take the metro to Saket metro station on the yellow line. • Exit the metro station, take a right and then you may take the sharing auto (Rs 10) or private auto (Rs 50). • Ask the auto guy to take you the IGNOU road and drop you off at P S Bhallara office(Sahib Real estate). • After that you should be able to see the whole white compound wall villa with Nivasa name plate. • Take the airport line into the city to Hauz Khas metro station(Magenta Line). • Take the yellow from Hauz khas metro station to Saket metro station. Click here for a map of the route from Saket metro station to Nivasa Backpackers Hostel. A- 44, Neb Valley, Ignou Road, Sainik Farms, New Delhi, Delhi 110062. You can choose between having breakfast sitting by the natural greenery and woods or up on the rooftop deck enjoying the sunshine enjoying the forest view. This stunning loft boasts open plan living with stunning interiors. Qutub minar the tallest minaret of the world and is just 10 mins drive from our hostel. Lotus temple built in the shape of lotus flower is again 15-20 mins drive from our hostel. ***Property Policies & Conditions: 1. Cancellation policy: 1 day before arrival. 2. Check in from 12:00. 3. Check out before 12:00 noon. 4. Payment upon arrival by cash. Credit card is accepted. 5. Reception working hours: 24 hours. 6. No age restriction. 7. Taxes included. 8. Breakfast included.